Here’s a stylish 18-year-old Japanese student named Aoi. 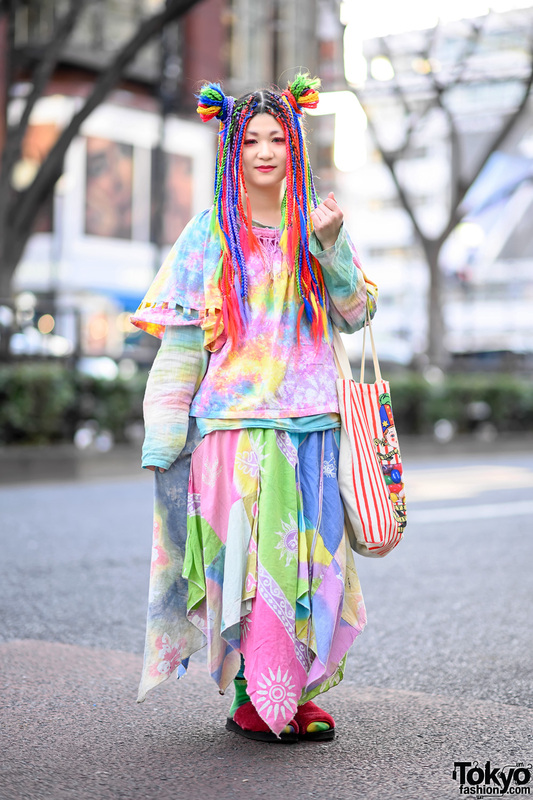 We’ve seen Aoi around Harajuku a few times recently and there is something about her look that always stands out. Aoi is wearing a graphic top from Topshop with short shorts from H&M and Bodyline rocking horse shoes. Acccessories – some of which came from the Harajuku vintage shop G2? – include sunglasses, dangling spike earrings, a tattoo necklace, spike and studded leather bracelets, and a cool clutch that she picked up resale. Aoi told us that her favorite Tokyo shop is Kotobuki. If you’d like to know more about her, check out Aoi’s personal Twitter. Click on any street snap to enlarge it. I like Aoi’s, beautiful thick blond long hair, no tatoos, no excessive ear piercings. She is great, you go girl…. I like her accessories and her shoes are great! Spikes, henna choker/arm band, and rocking horse shoes. She’s gorgeous. Love her style – and her shoes! Simple yet edgy. what kind the shoes that she wearing?i like it want to get one.